Not all eating plans work for everyone. My advice to people who want to see what healthy foods work best for their body is “Try it”! I’ve been hearing a lot about the Paleo Diet and I recently found my new favorite blog “Going Cavewoman” that has delectable recipes and fun ideas for trying Paleo on for size. 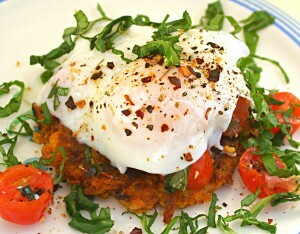 This delectable recipe caught my eye..
Sunday breakfast. Time to enjoy the roses. A day to kick back in bed all morning, drink freshly pressed dark roast French coffee, read the paper (love the fact that it is on-line now) and not feel guilty about switching off from all the daily responsibilities. A day of rest. Most people have a pretty crazy week, working and cleaning and taking care of business. Sunday is a special day when you can take time for yourself to recharge the batteries… well after you have made the coffee and the breakfast and cleaned up the kitchen. What is your Sunday all about?? Grate the potato and onion into a bowl. Season and add egg and stir together. Heat oil in non stick pan and add a dollop of potato mixture. Make them small because there is no flour, so if they are too big, they will break when you take them out. Cook until gold brown on med-high heat. about 10-15 minutes total. Heat a pan of boiling water, take it off the heat and add the egg very gently and slowly. Keep the lid on and let sit for 8 minutes. Return to the heat on very low, and let egg cook until desired softness. Pile tomatoes on top of pancake on the plate and add the egg and basil. Season. Paleo is short for Paleolithic, and the premise of a Paleo diet centers around the idea that our genes have “programmed” us to eat certain foods — meaning 70% of food consumed today (processed packaged foods, fast foods, and even homebaked bread) can take a toll on our health. A Paleo diet focuses on eating lean meats, seafood, and vegetables, some fruits, nuts and seeds and can be a very healthy way of life. On the downside when it comes to “treats”, paleos must say no to sugar, dairy, processed foods, and alcohol. Legumes, a noted health food, are also on the “no” list. Grains can cause inflammation or allergies in the gut and can offset blood sugar. Some grains also contain saponins, and phytic acid that can upset your digestion. For dairy, lactose can be hard on digestion and some people have allergies to casein, the protein in milk. Paleos avoid unhealthy fats like trans-fats and omega-6 fats, which is a good idea on any eating plan. Looking for more of Cave Woman’s recipes? Also be sure to check out her amazing skin care line, I’m hooked on the blueberry cleanser. Well, my Sunday couldn’t be more different from yours. Mine involves going to church…as I am a Christian and a Pastor. But I truly do appreciate the recipe…it looks delicious! Thank you! Love the name of your new favourite blog.. Going Cavewoman. I have heard a lot about the Paleo diet but haven’t really understood what it’s all about. Thanks for the explanation and the tasty looking recipe. There is a similar diet out these called Primal Blueprint that takes the Paleo philosophy and expends on it. It does allow raw or full fat organic dairy products on a very limited basis….and as “splurges” 1 glass of red wine and/or a piece of organic dark chocolate.